Black Channa and Potato Curry / Kondakadalai Kuzhambu, this is a common dish in Tamil Nadu. There are various versions in making kondakadalai Kuzhambu. The one I am posting here is a masala type kuzhambu. The same curry can be made using tamarind extract also, which will be like puli kuzhambu. Masala kulambu will taste good for both tiffin items as well as rice. If you are making it as a puli kuzhambu, you can add other vegetables also instead of potato like brinjal, raw banana, mango, etc. I will try to post that curry as well when ever possible. Ginger Garlic Paste - 1tbsp. Coriander Powder - 2 tbsp. 1. Pressure cook the channa for 4 to 5 whistles. Pressure cook the potatoes separately and cut into medium sized cubes. Finely Chop the onions and tomatoes. Prepare ginger garlic paste and keep it ready. 2. Heat oil in a pan and add chopped onions and curry leaves. Saute till the onion turns golden brown color. Add ginger garlic paste and saute till the raw smell goes off. 3. Add chopped tomatoes and saute for a minute. Add turmeric powder and salt. Mix well. 4. Cook till the tomatoes are soft and mushy. Add the cubed potatoes. 5. Mix well and add the cooked channa. 6. Add enough water and allow it to boil. Take a blender and add grated coconut, red chili powder, coriander powder, garam masala. Grind it to a paste. 7. 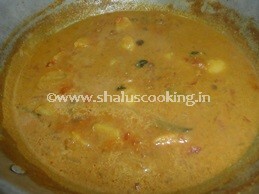 Add the ground masala paste into the curry and cook till the raw smell of masala goes off. 8. Switch off the flame when the curry becomes little thick in consistency. Black Channa and Potato Curry / Kondakadalai Kuzhambu is ready to serve. Can be served with hot steamed rice, idli, dosa, chapati, etc. I was Searching for Brinjal Curry for rotis but here I Found Potato Curry. this is also good and it can be eat with Roti. Thanks for sharing this Article.